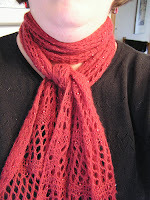 As you may remember, I knit a cashmere scarf for my friend Fabio's wife. He provided the yarn, I provided the labour. Part of the payment, was the joy of knitting with such a fine fibre, and the other was keeping the extra ball of yarn if it wasn't needed. Well, it wasn't so I told Fabio I was going to knit something for my mother with it. Being the classy guy he is, he bought me another ball of this beautiful yarn in a colour I love, so I would knit something for myself. This was the result. It is probably the nicest thing I ever knit myself, and since it was given to me as a token of friendship, I am thrilled it has come out so well. Mia madre ama il suo maglia caplet. La vostra generosita ha reso possibile. posted by shyknitter @ 2:23 p.m.